I didn't just run out and start buying Yorkshire Terriers to breed .... I've taken my time and searched not only the US, but other countries, to find just the right Yorkshire Terriers to start my breeding program. It's not been easy to find my dream Yorkies. But I have found a few! And I'll continue looking and may add a couple more. But it will take time, good dreams don't come easy, but I'm excited about my wonderful start and invite you explore my web site and take a look at pictures and pedigrees of my dream Yorkies! I'm not an inexperienced breeder! I've breed some of the most darling little Chihuahuas and I will always love that breed! I've taken my knowledge of dog care and breeding ethics and have expanded my dream, of breeding little Yorkie puppies. 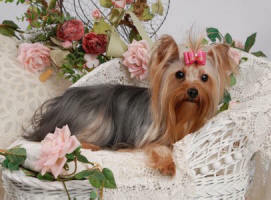 I will proudly display pictures and pedigrees of each of my Yorkshire Terriers. I will note their characteristics and their temperament. You will also find extended information on my Yorkie puppy nursery page, offering only delightful healthy Yorkie puppies for sale. Dream Maker Yorkies believes in producing the very best yorkie puppies possible. And because of this we have very strict guidelines that insure the health of our yorkie puppies. All of our yorkie puppies follow a tried and proven regimen of worming and vaccinations. And we follow this up with a vet check. 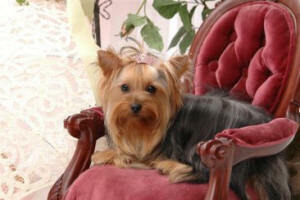 We KNOW we produce not only beautiful Yorkshire terrier puppies, we produce healthy ones. And we gladly back this up with a written health guarantee on each yorkie puppy we sell. We ask a lot of questions before we place one of our special yorkie puppies. You are welcome to do the same. We'd be happy to discuss our routine health care practices with you. So, look through our site, check out our adult yorkies, our adorable yorkie puppies...then e-mail or call with any questions you may have and we'll discuss yorkies! Website and Images Copyright 2008 © Dream Maker Yorkies. May not be copied or used without permission. All rights reserved. Website Design by KJ's Designs -Keeping it Simple. Making it Happen.